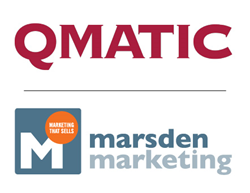 We are excited to partner with Qmatic to further build on their leadership position in North America and around the world. B2B companies seek out Marsden Marketing's results-focused expertise as a full service digital marketing agency that integrates digital marketing and PR to accelerate clients’ brand positioning and propel their lead generation programs. Based in Atlanta, Ga., Marsden Marketing serves both emerging and established B2B clients with a strong focus in the technology and professional services markets.